Alright, so Andy Murray won Olympic Gold, at Wimbledon, against Roger Federer, in straight sets. That’s cool, good for him. I’m actually quite surprised that Federer played so poorly. I thought the match would have gone a bit longer, or even a bit more of a fight. I’m not saying that the match for the gold medal was a complete wash; to me, it just seemed that it was nothing more than an exhibition. The match between Murray and Federer didn’t have them same electricity than that of the match they played two weeks prior. Were tennis fans bored by the non-Wimbledon, Wimbledon? Honestly, I was already a little burnt out by keeping up with all the matches and dramatic wins and losses. Could I stand to watch another week of tennis that seemed to have been organized by a fourth grader? The draws were hard to find, the schedule was a little unclear, and being able to find it on TV was also a challenge; some days it would be on NBC and others would be on Bravo. Let’s not forget that the matches were held 8 hours ahead of me (I’m on the west coast); I have been playing “catch up” with my sleep schedule even since Wimbledon. I put on my best and settled in for the historic match between Roger Federer and Andy Murray. Federer also looked like he was playing catch up against Murray in the finals/gold medal match. Murray, clearly the fresher of the two, would not give an inch in any of his service games. Federer looked completely lost, shanking forehands and backhands and produced some lousy footwork at net. Andy Murray played the best I had ever seen him play, it was something epic that the Scot came up with. Game after game, Murray found leaks in the Federer game, hitting passing shots easily, coming up with clean winners with out putting in much of the effort. It was as if Andy Murray and Roger Federer had switched bodies. Andy Murray kept his foot firmly on the accelerator. I didn’t really see much of a weakness from Murray, he was calm and fluid. I’m sure he knew that he was serving for the match, though it did not look like it at all; he was that calm. After he bombed that final ace, Andy Murray dropped his racquet, shook hands with Federer and the umpire the quickly ran up to his camp where his team awaited to congratulate him. Judy Murray (Andy’s mom or mum) was in tears, so proud of her boy, the 2012 Olympic Gold Medalist. They embraced and Murray went back to the court to express his joy with the crowd of Centre Court. 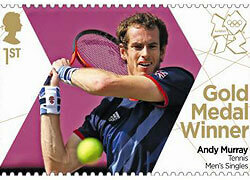 I will admit that Andy’s win over Roger at the Olympic games was incredibly impressive. I still, however, have to bring y’all back to ATP reality, it’s not a major title. Murray has had four opportunities to capture his first major title. He played a better major final at his last attempt at the All England Club than that of his previous showings. Does this Olympic gold medal and win over Federer mean that he might actually win a major title? Maybe. If he plays like he did, confident and effortless, he will not only win 1 title, he could very well win a bunch! I have a feeling that Andy Murray will be a serious threat at the 2012 US Open. A side note: I feel bad for Roger Federer, this was his third Olympic showing trying to capture the elusive Gold medal. He has the silver medal is impressive, though gold would have complimented his current records and doubles gold (Beijing 2008) a bit better.